I’m building a new race quadcopter since I want more performance than my current one (3S with 1804 motors). I decided on EMAX RS2205 motors with DYS XM20A ESCs. I went with the EMAX NightHawk 200 frame because I like the lower top plate to keep the CG close to the center. The 4mm bottom plate should be strong enough to hold for most crashes as well. As usual when ordering from HobbyKing I purchased a few extra things, like a thrust stand (they have a newer V2 but since it was out of stock and I already own a power meter I got the v1). So I decided to get a few different 5” props and do a comparison, unfortunately HK has annoyingly low limits until you get “parcel too big, please split into two orders” errors, so I could only fit 3 different types this time. I’ll update this post if I order more later on. I’m running the motor from a 4S 4400mAh 65-120C to be sure that the battery doesn’t limit the current draw. I’m measuring current and effect with a Turnigy 130A Watt Meter and Power Analyzer that I can’t find on HK any longer. I’m also measuring the RPMs with a Turnigy Tachometer but I don’t know how good my measurements were, it seemed a bit flaky, maybe due to low lighting. I didn’t include all the data in these graphs, but everything is available in a Google Docs spreadsheet. 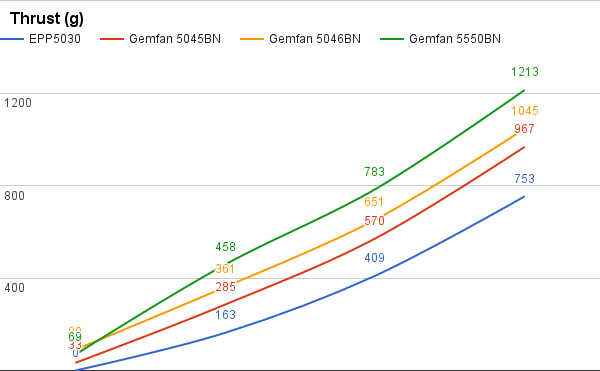 The props I tested was a spare EPP5030 from my old machine, a Gemfan 5045BN, a Gemfan 5046BN and a brutal Gemfan 5550BN. Note that the 5550 will not fit the EMAX 200 frame since it’s too large at 5,5”. 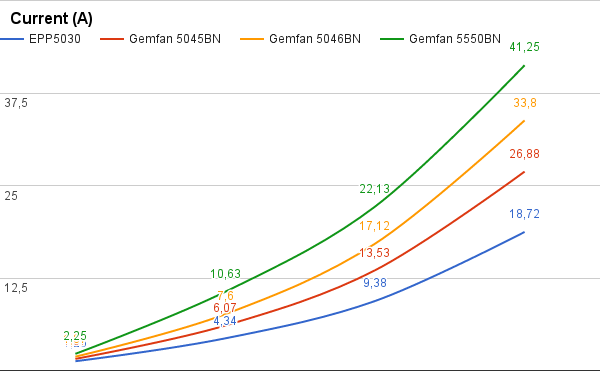 I obviously wouldn’t recommend the 5550BN when using a 20A ESC since it pulls over 40A at full throttle, even the 5046BN is a bit high at 33,8A, but the 5045BN should be safe, since most 20A ESCs should be able to handle burst currents of around 25~30A. In an earlier post I built, installed and benchmarked a steam machine. The only thing that was missing was the case, and I promised an update when I got it, and it arrived in the mail today. 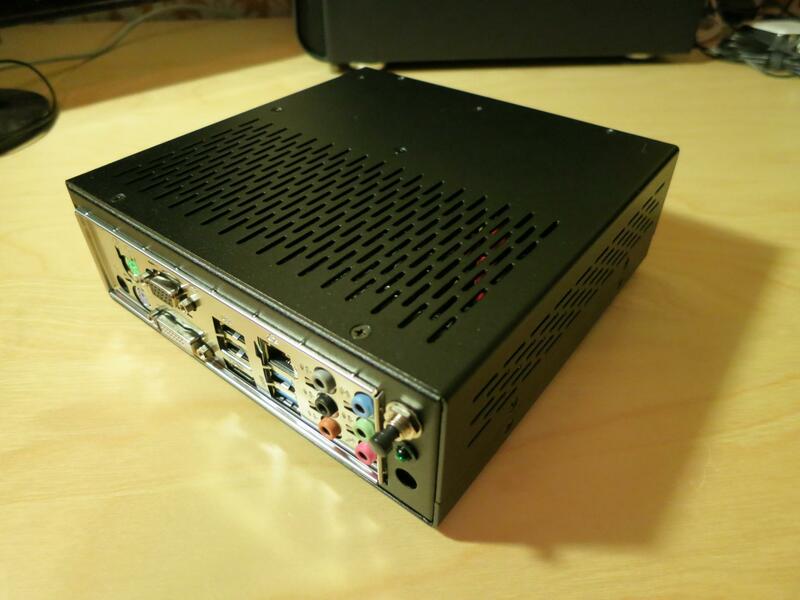 There’s not really much to show, it’s an EMKO EM-154B that I bought from Mini-ITX.se. 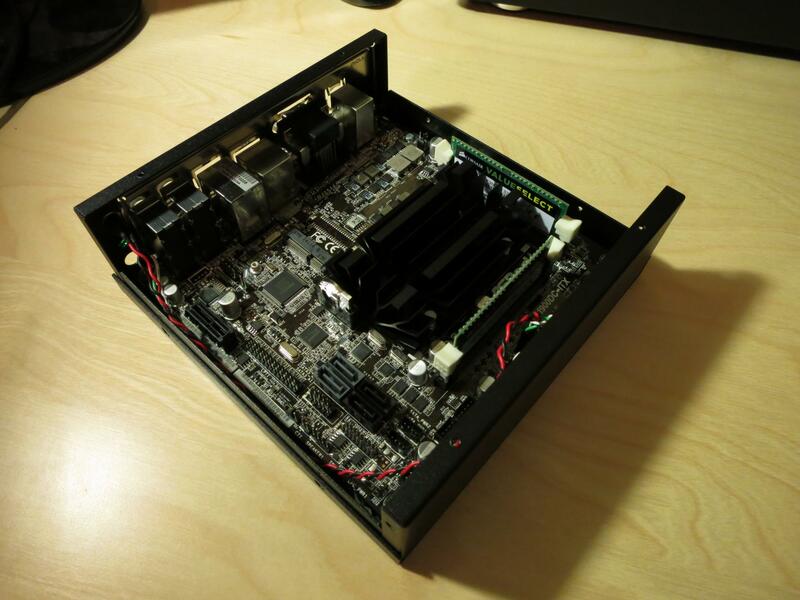 It has a bit of an industrial look to it, but it doesn’t bother me, and it was the smallest Mini-ITX case I could find. The only issue I had was that the connector on the SATA power cable that came with the motherboard was angled in the wrong direction. So when mounting the SSD in the lid of the case it didn’t fit. This was easy to solve though, just remove the cap on the rear of the connector, pull out the cables, flip the connector over and push them back in. Just make sure to put them in the same place. I usually watch TV shows on my laptop in bed before I fall asleep. Some nights I manage to fall asleep before the end of the show, without turning off my laptop, which means that it gets pretty hot due to the air intake being blocked. So with the launch of the Raspberry Pi 2 I’ve decided to make a more permanent solution, placing one of my old 24” monitors on my nightstand and run Kodi on the RPi. As always the distro of choice is Arch Linux. This installation guide will assume that you’re running Linux, if you’re on any other O/S you’re on your own. It will mostly be an overview, with references to information on other pages since I think it’s meaningless to repeat everything that’s already available. Download the image, I recommend that you check the md5 after your download has finished to make sure everything went okay. To get it all installed properly on a card just follow the official instructions under Installation. The first thing I do after booting the RPi is change the hostname, timezone and keymap. The regular Arch installation guide will show you how to do this. After this you can run pacman -Syu to update the system. If you’re like me and don’t need overscan (if the text in the console is a bit in from the edge) you should disable it by uncommenting disable_overscan=1 in /boot/config.txt and on the last row of that file you need to change gpu_mem=64 to gpu_mem=256. After doing this we should reboot with systemctl reboot. The next step is to install Kodi, specifically the Raspberry Pi version with pacman -S kodi-rbp, when prompted about libgl provider just hit enter for the default mesa-libgl. After everything is downloaded and installed you should enable Kodi to start at boot with systemctl enable kodi and then start it with systemctl start kodi. After a few seconds of loading Kodi should start. I’ve made some very scientific measurements using a stopwatch and there’s about 16 seconds from plugging in the power cord until the Kodi logo is showing. Systemd-analyze says Startup finished in 5.659s (kernel) + 3.964s (userspace) = 9.624s which is rather impressive in my opinion. However the most interesting thing to test is how it handles video playback, so I downloaded the 80 Mbit/s test file from here. The file is streamed from my NAS over Samba, using a wired connection. The RPi struggles to buffer it fast enough, and since it only has a 100 Mbit/s NIC it’s understandable, I measured 94.1 Mbit/s with iperf so it’s pretty close to the limit. However from a CPU performance standpoint there’s no problem at all, with an average load at around 0.5 and an even load across the 4 cores. I switched down to the 70 Mbit/s file but I still had some occasional stuttering. When going down yet another step to 60 Mbit/s I get perfect playback with no lag or stuttering at all, so time for some graphs! I used a modified version of the script I made for my last blog post. The sample movie is 60 seconds long and I logged data for 90 s to be able to see idle load as well. The rrd file is available here. I also found this test on Phoronix, so I installed phoronix-test-suite so I could run that same benchmark and compare my results to the old single-core RPi. You can see the full benchmark results over at http://openbenchmarking.org/result/1502103-KWAR-140722031. 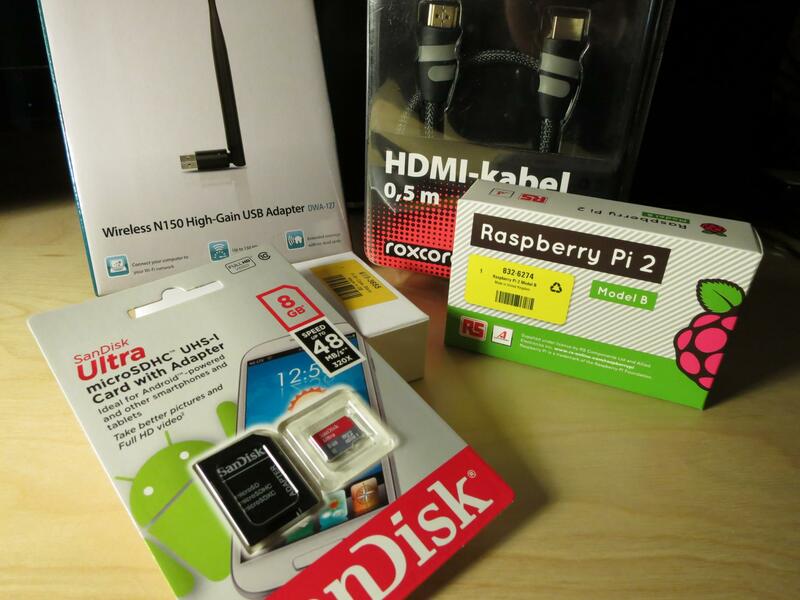 The new Raspberry Pi 2 is a much better option for a cheap HTPC than the old one. 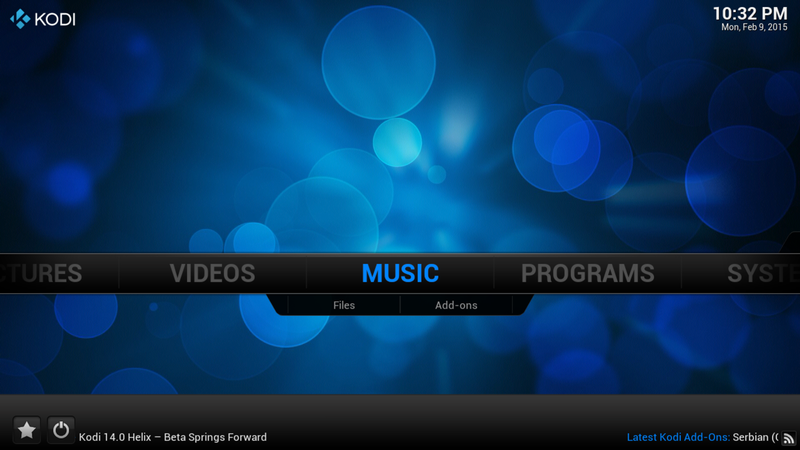 It doesn’t have that horrible lag in the Kodi menus and it handles movies without issues. It could also make a great energy efficient web server for static pages as the Nginx benchmarks show. The weakest link seems to be I/O, the network card is internally connected to the USB bus, so it shares bandwidth with the four USB ports, something to consider if you plan on attaching storage devices and accessing them over the network.